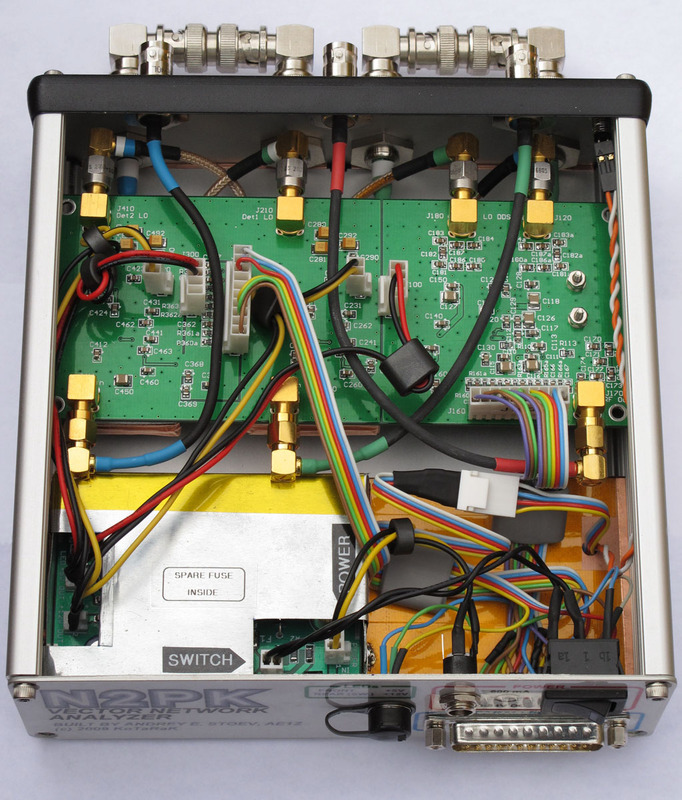 Finally, about two months after I started working on it (with the "partial support" of my patient wife :) - the finished VNA is waiting for its aluminum cover. Really glad, that the build is over - it was a fun project but I am not sure if I am going to build a second one. I am very satisfied with the results - a very precise, lab grade instrument in a professionally looking package - one can hardly tell that it is not a "commercial product". The initial testing went just fine as expected. I spent a lot of time, making sure that everything is done right, inspecting every single solder joint and checking every component so I was not expecting any major problems. Everything worked the first time I plugged it in! A note to myself: Next time I decide to build something with 7 bulkhead BNC connectors on the front panel - get a Greenlee D-hole punch. Shaping that many D-shaped holes with a regular drill and a file was tedious work. It is a pretty tight install - once everything is in place and connected, there is not much space wasted in the Hammond enclosure. 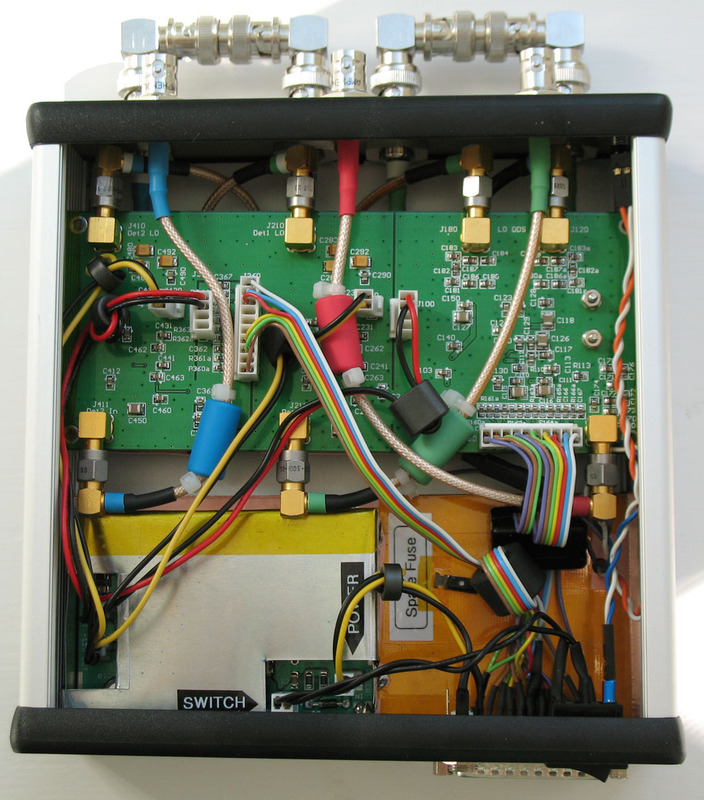 2010 Update: This picture shows the final version, using semi-rigid coax (RG-405) for Detector inputs and RF DDS out. The coax is in black heat-shrink tubing - just did not like the idea of exposed conductors crossing above the VNA PCB. The control/power cables were re-organized too and an accessory connector was installed. The Hammond enclosure comes with two elegant bezels for the front and rear panels. When the bezels are installed, they stand between the enclosure and the panels. Under "normal" circumstances (DC/low frequency applications) this is OK. Since these bezels are plastic, the face-plates are electrically connected to the enclosure only with the 4 corner screws. In the RF world things are a little different. The electrical gap which occurs because of the plastic trim can cause signal leakage to and from the VNA. 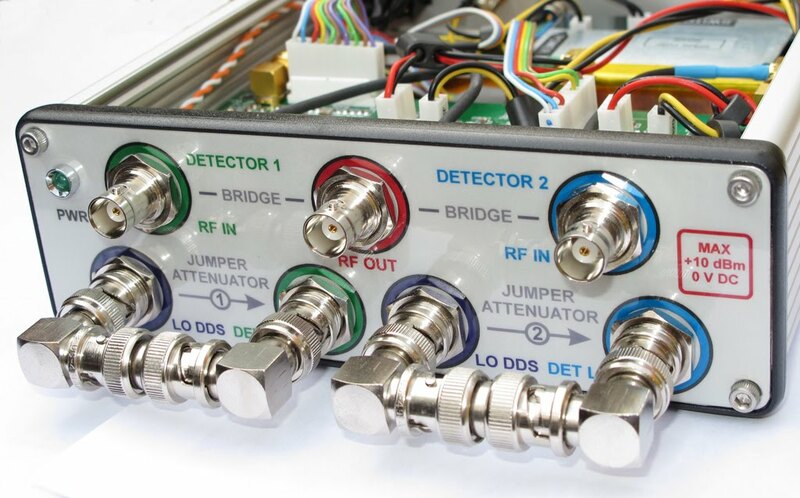 It degrades the overall RF shielding of the aluminum enclosure and affects the impedance-to-ground of the front panel connectors. I solved this issue with 6mm strips of self-adhesive copper foil - I wraped the 3 surfaces of the inside plastic edge with copper foil, covering all 4 sides of the bezel. When the plastic bezel is sandwiched between the panels and the enclosure, the copper foil serves as electrical bridge between the aluminum face-plates and the enclosure, while creating continuous RF shield on the inside. 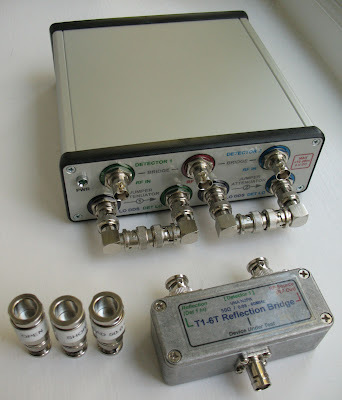 This is the complete set - VNA, Reflection bridge and OSL calibration standards. Since the calibration standards determine the accuracy of the measurements, I paid extra attention while building them. For the 50 ohm load I used small (0603) thin-film resistor - optimized for high frequency use (up to 20GHz) (Digikey P/N FC0603-50BWCT-ND or FC0603-50BFCT-ND). The construction of the OPEN and SHORT standards was also done very carefully. I am planing to make 2 more sets of calibration loads - N-type, SMA and UHF loads. This way I can use adaptors BNC-to-"X" and calibrate after the adaptor or at the end of the jumper cables regardless of their type and without using more adaptors. The last thing left to do is to organize everything in a Pelican 1450 protective case. Feb 2011 Update - My complete VNA kit fits nicely in a Pelican 1500. This case is water-tight, very durable and makes it convenient to store and transport the VNA with all of it's accessories.